Does a design this iconic need a revamp? Apparently so. Originally designed in 1974 and launched internationally in 1980, Rubik's Cube is a design classic that's sold by the hundreds of millions. Over the years, it has delighted – not to mention infuriated – countless people around the globe. The original cube was an extremely clever piece of design and engineering that defied improvement; it's been refined so that speed-cubers can turn it even more times without the cube falling apart, but basically this is one of those situations where the design thinking was absolutely bang on the first time. Pick up any Rubik's Cube, or indeed any imitation cube, and you know exactly what to do with it – even if you don't know how to solve it. Who needs a high-tech update when the original just works? Well, it turns out that lots of people do. Designed in Israel by Tel Aviv company Particula, the GoCube is pitched as the Rubik's Cube reimagined with brains. It still behaves the same as a standard Cube, but now has loads of clever high-tech features designed to help you learn how to solve it, improve your times and even race against friends online. 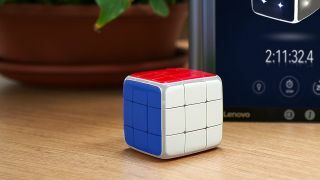 The GoCube tracks its movements using built-in sensors, and connects via Bluetooth to an app that displays your cube on your phone or tablet, and also features various games and challenges to improve your cube handling and instincts. It's set to retail from an eye-watering $119 for the basic GoCube, but if you want to get your hands on one at a substantial discount, you'd better hurry over to the GoCube Kickstarter, where you can save around 40 per cent on various GoCube packages. The GoCube might sound expensive but that's not holding anyone back; it's torn right through its original Kickstarter goal of $25,000 and has clocked up over $800,000 of pledges. There's now less than 24 hours left to run on the campaign.